SPISim specializes in IBIS-AMI modeling service. You will find our modeling requirement and process in more details on this page. Encrypted look-up or parameter table files for these AMI models. Example work space or test-bench files in ADS and/or HSpice setup. If more than one models are to be delivered, their analog front-end and AMI portion may be consolidated into same .ibs (assigned to different pins using a model switcher) and .dll/.so files. .ami files are usually separated for each individual model. SPISim builds these AMI models all from ground-up using C/C++. We do not require any 3rd party pre-requisites such as Java, Matlab or Python etc. While source codes are available separately, they are NOT included by default. We do NOT use any open-source libraries licensed under GPL or similar non-close-source friendly terms. Simulation: Several differential simulations under different test-loads. Simulation: Simulation of (encrypted) silicon design or behavioral model. Data-sheet/Spec. : Based on performance spec. listed on the data sheet. Measurement: Lab based time-domain and frequency domain measurements. Regardless types of collateral, we will provide detailed instructions on how to perform and run these simulation/measurements in order to obtain data for modeling. Most of the time our client prefers to perform the simulation themselves due to IP concern or familiarity of the actual design. NDA can be signed before obtaining these collateral for evaluation. We use various modeling techniques to model the EQ behavior for AMI! For example, some data sheet may allow tens of thousands of parameter combinations for different EQ settings. While having simulation data for all these combinations is preferred, yet it may not be possible in some cases. We employ techniques such as DOE, ANN, Table-lookup w/ bi-linear interpolation etc to make sure all solution spaces will be covered by the delivered model even with limited data set. Tens or even up to thousands of such data can be modeled as a single AMI model, if it’s the same part number. We can handle data in common formats such as.csv, .tr0, .sNp, .raw etc. We will offer sftp/cloud storage for clients to upload these model data. 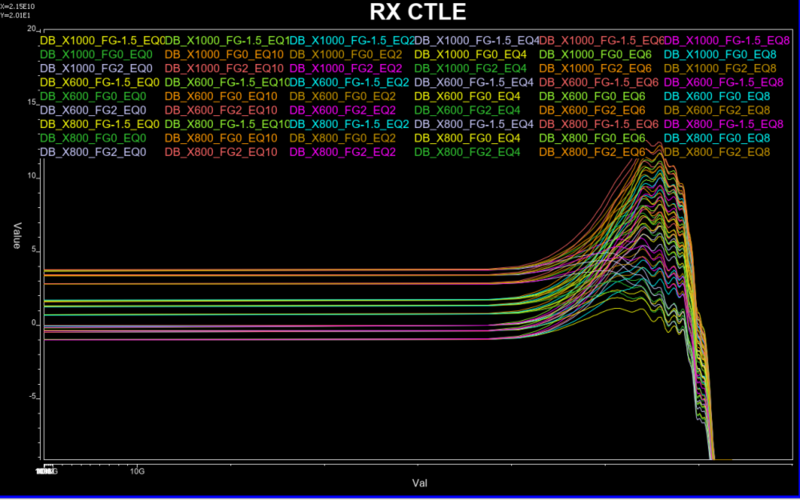 An “auto-tune” process in our tool enables us to automatically identify associated tap weights and TD response parameters for these FFE and CTLE models. Once an AMI model is created, we first run full factorial sweep to cover all the solution spaces and compare difference to check performance against original/provided data. 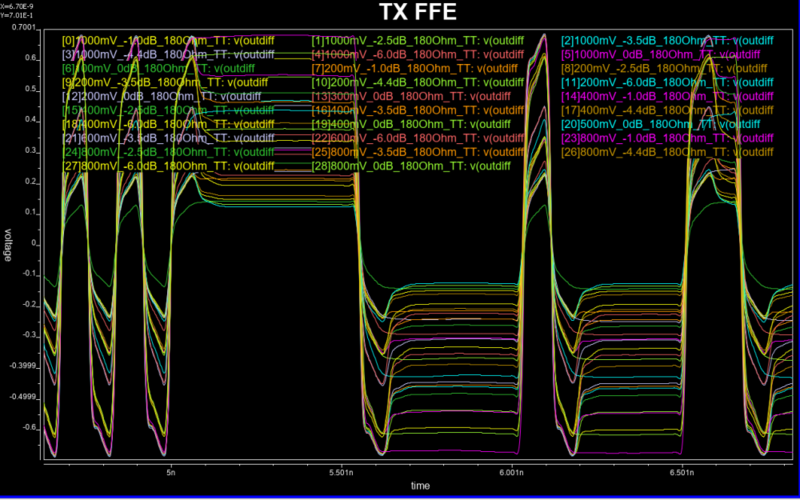 This includes difference in terms of de-emphasis level at time domain for FFE-like Tx EQ, and/or frequency domain gain difference at several key frequencies for CTLE. For DFE/CDR, we have mechanism to generate tap’s adaptation histories to verify that they entered “lock” state. After this full coverage check, we then use 3rd party commonly used EDA tools to verify their performance on various platforms. We have licensed ADS from Keysight and HSpice from Synopsys on both Windows and Linux platforms to support this validation. Models should also run under HyperLynx from Mentor, Neximm from Ansys or SystemSI from Cadence. Often times our clients are also new to channel simulation… with client’s license, we will try our best to help resolving issues should these EDA tools are used instead. However, we are NOT in a position to support other EDA vendors’ tools. Models and associated usage guide, test benches will be delivered digitally. Delivered model(s) will be locked initially during the testing phases which is about one month. License codes are generated on a per “part” basis. We will address any feedback and concerns identified during this period. A perpetual unlock codes will be delivered upon satisfaction before the temporary codes expires. That’s when client acquire the model’s IP and may release to his/her end users. Invoice will be sent at this point. SPISim stands behind the qualities of the model delivered. We will continue to resolve accuracy issues identified after model delivery for this particular same model. IBIS and IBIS-AMI models can be delivered within one month after all qualified data and PO are received, which-ever happens the last. Usually the delivery time can be sooner. Rush service is also available (may subject to additional cost) which will shorten the delivery time to be within two weeks. “Same day” delivery is also possible if your model has only several corners and it is supported by our existing models already. Check what models we already have using [free tool: SPISim_AMI]. At its simplest case, our model can be had at as low as 5 thousands USD. This assumes user uses [our SPISim_AMI tool] to generate temporary models with any number of corners and validate themselves in their own desired tool. In this case, the purchase is for license code to unlocked these user generated models permanently. A typical AMI modeling project usually requires us becoming vendor of client’s company, 1099 form for tax purpose, statement of work, official quote and purchase order. One IBIS plus one IBIS-AMI models of such project is about or under 20K regardless of number of corners. Discount will be applied if multiple IBIS+AMI are done in the same project. In some cases, multiple IBIS model may be required to work with same EQ circuits in order to cover proper analog behaviors. Additional fees may apply based on number of extra IBIS models is required in this case.